Merry Christmas from IDV Solutions! Behold the fun that is a NASA satellite imagery Christmas ornament! While your future holds a fair bit of cutting and stapling, I assure you the lion's share of the hassle of this project lay in the creation of the globe template, trying to figure out good-enough coordinates for each of the 20 panels, and getting those pesky registration letters right. So, I hope you can overlook my less-than-perfect seams, and don't use this globe for navigation purposes. 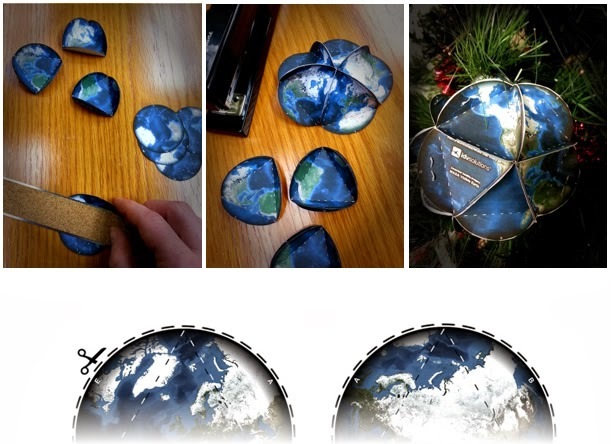 Grab the template and get your home-made 3-D NASA imagery globe ornament on! Dominate your map nerd Christmas decorating with this crazy December satellite imagery sphere! Also, if you have kids, make them do it. That way, you'll feel the smug satisfaction that they are "learning" something and you can keep your 24-year streak of not having used scissors alive. Maker Mama, in addition to having a cool blog handle, gives a way more useful set of instructions, here. She uses a glue gun and an insanely specific circle-cutting tool, but I was lazy and used a stapler and some scissors. Good enough! The gist: cut out all 20 circles, fold their three edges up, then join them based on the little letters I meticulously provided. Magic! FYI, the imagery comes from the fine folks at NASA's Visible Earth, who provide could-free (not sure how they did that for Michigan) global satellite imagery for each month of the year. To download the PDF template and get the global assemblage going, click here or on the image below. Print that template, and make what might be your first globe ever. You can do it!! P.S. If you accept the challenge, and rock your tree with this ornament. I'd be excited to see snapshots of the festive results on Twitter. So keep me posted, nerds! What kind of paper should I use for printing?